Geoff and I have visited Lucca in Italy several times for day visits when in the area but never stayed over. 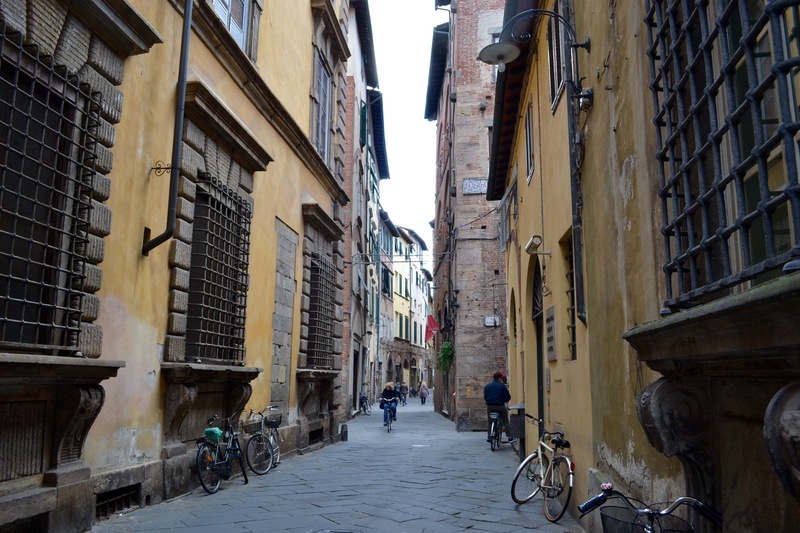 This time we opted for two nights in Lucca just before returning home after a great holiday full of cycling, wine and food. 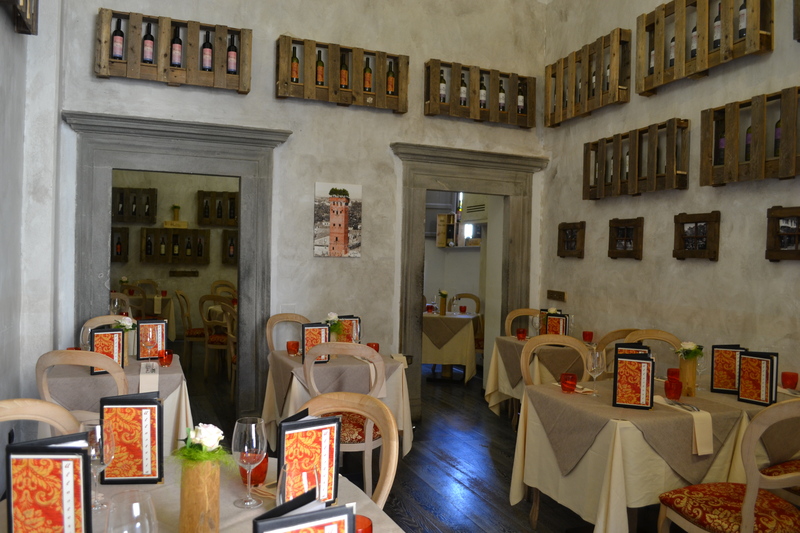 Lucca is a charming old walled Tuscan town – we stayed outside the walls at Al Porto di Lucca, which was very good with an excellent breakfast plus a free parking space. Lucca appeared to be a little busier than I remembered. I always thought it was closed to vehicles apart from scooters, bicycles etc., but there seemed to be cars everywhere which just irritated me. The roads are very dark and narrow but people always seem to want to drive a great big 4×4 down them for some unknown reason. We try never to enter a small walled Italian village, even with a Fiat 500 as we accidentally did so once. All I can say is, never again! 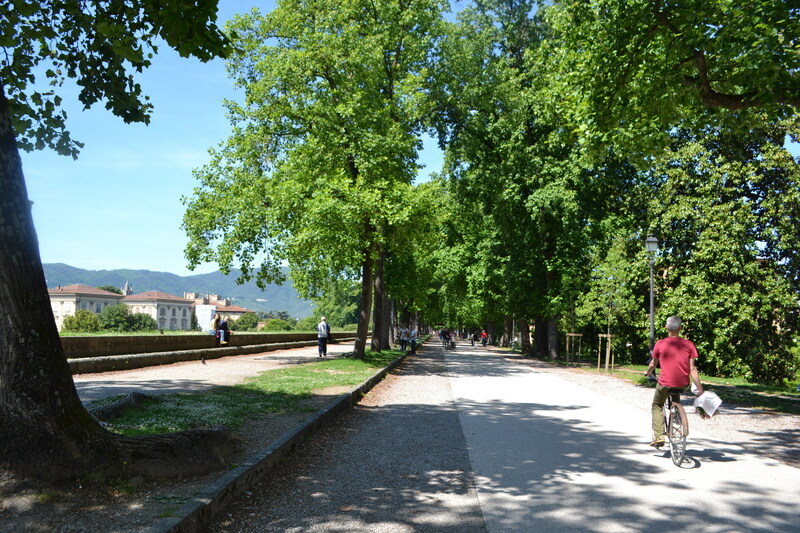 On the top of the city walls (ramparts) surrounding Lucca people walk, run, cycle, rollerblade, you name it. Our son Peter camped there whilst on his cycle journey back in 2011 (he’s currently cycling India with his sister Helen after cycling Africa). When he woke the next morning brushing his teeth he looked up and found a tour group watching him. It seems his camping spot was a little more public than he first thought. Anway, I digress. Allosteria was number 2 on TripAdvisor at the time and we did eat at number 1 the following evening but found it a slight disappointment and thankfully got to eat at Allosteria again on our last day, so we ended our holiday with a fab meal. The staff were so friendly and even when we went to pay a visit to the loo someone was there to open the door for us, what service! 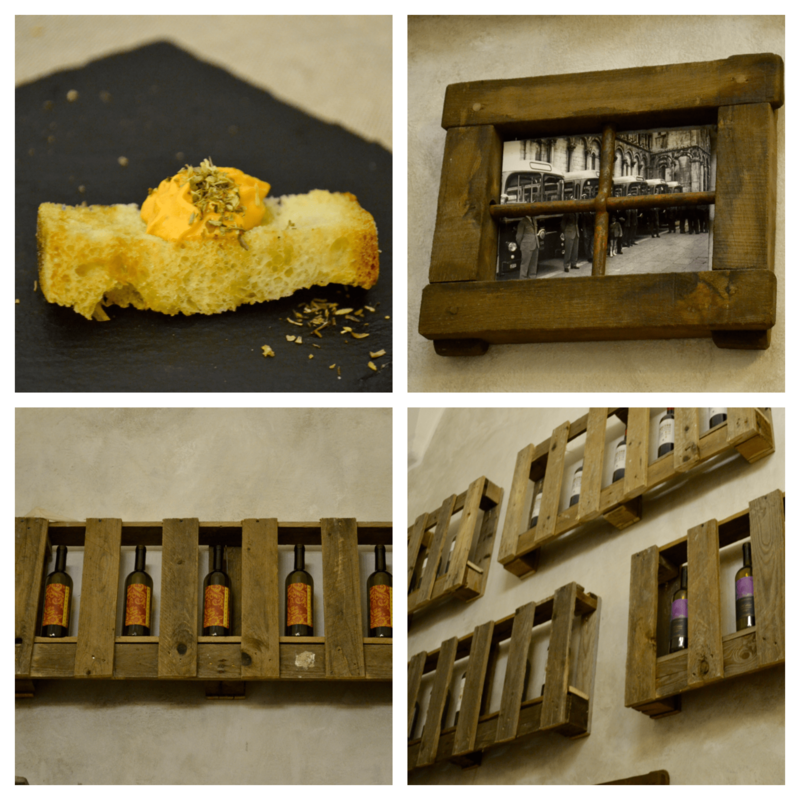 We were each given an amuse-bouche, I forget what it was, and a basket of fresh breads, slices of foccacia, the usual white and Lucca’s raisin & aniseed bread, Buccellato which is lovely if you like aniseed. Geoff doesn’t, so all the more for me. Great. We’ve had quite a bit of beef this past week and everywhere we go seem to have the same menu, only differing very slightly. 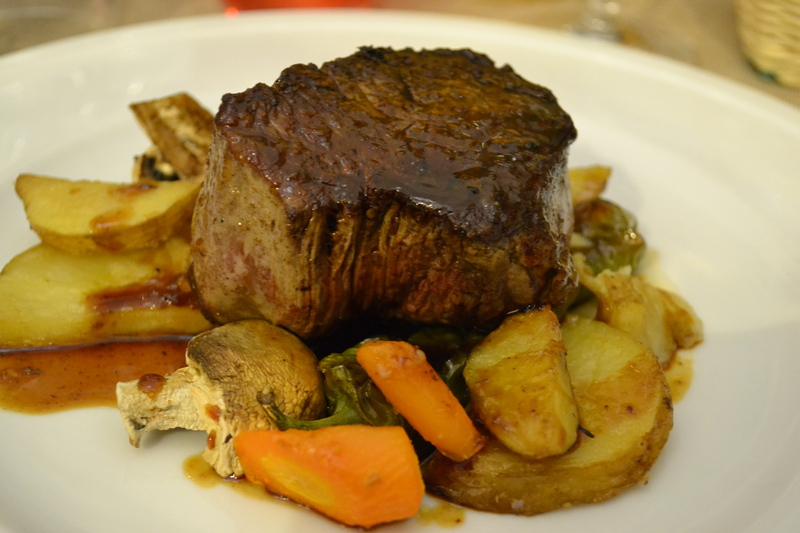 Oh wow, my beef tenderloin was amazing! It was a very thick piece, cooked medium so fairly raw in the middle but it was beautiful, no gristle or fat whatsoever and the best piece of beef/steak I’ve had for ages. The mixed vegetables served with it were half sliced grilled mushrooms, roasted peppers, potatoes and carrots. Geoff went for the tagliata sliced beef with vegetables. Geoff said it was very nice and very good quality. 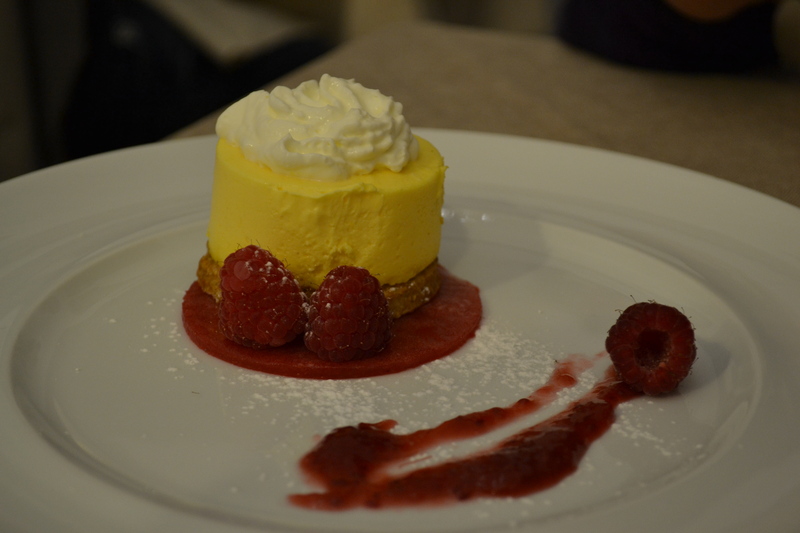 Dessert time! I went for the degustation of chocolate with rum. Expecting chocolate in several different ways like I’ve had in other places such as Annie Jones in Petersfield, it was just a little disappointing. A long slate contained around 6 pieces of chocolate (two pieces of each sort, or should of been I guess), of which two piles seemed to be the same but one pile had pistachios in it. I’m not a lover of rum (it makes me pull a face when I drink it as whisky and brandy does too). I was given a spoon to eat the chocolate – not sure how that would work – however I discarded this and used my fingers. I did think of just popping it all into my handbag for the following day. 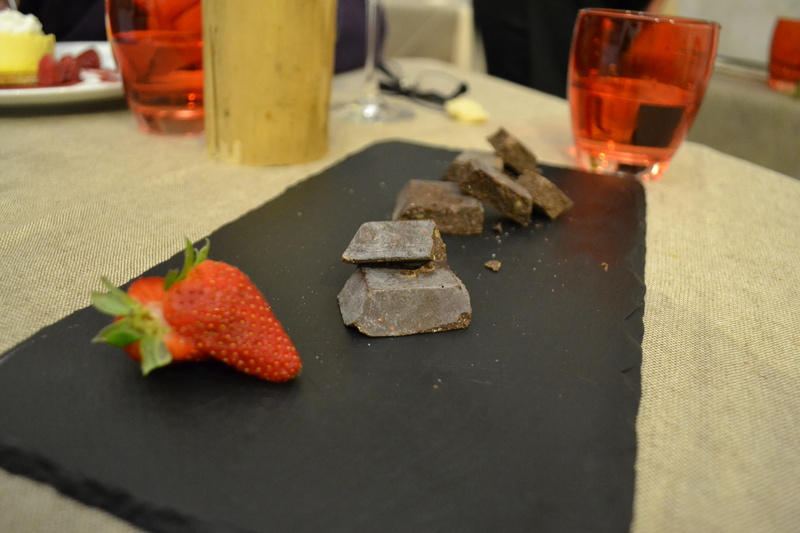 Whether the chocolate was from Lucca, a special one made in Tuscany or if it contained 70% 0r 80% cocoa or what ‘notes’ I should have been tasting, whatever, I’ve no idea so as far as chocolate tasting went it was lost on me. Actually now I’ve Googled it I should have known what it was. 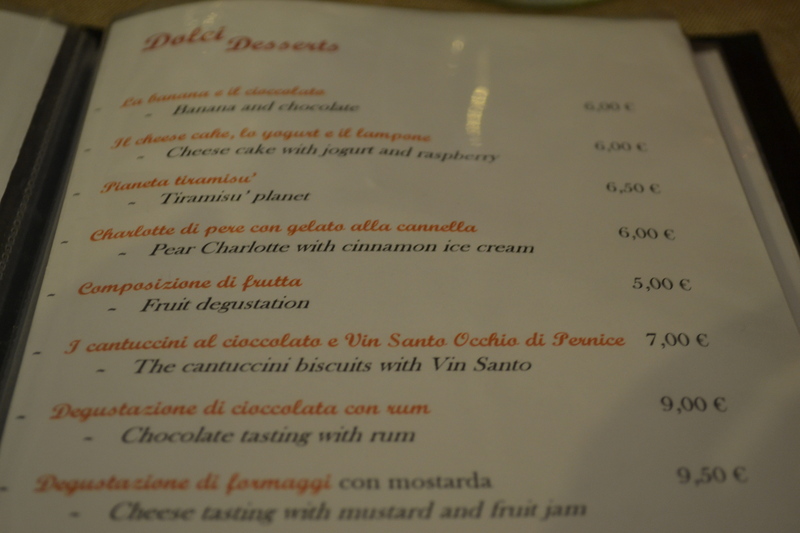 To be fair it does say ‘chocolate tasting’ on the menu translated underneath. My fault, I just saw the word ‘chocolate’ (and I don’t really like rum so why on earth did I order it, duh), but still as I said, some information on it would have been nice. Geoff ordered the right dessert, cheesecake. 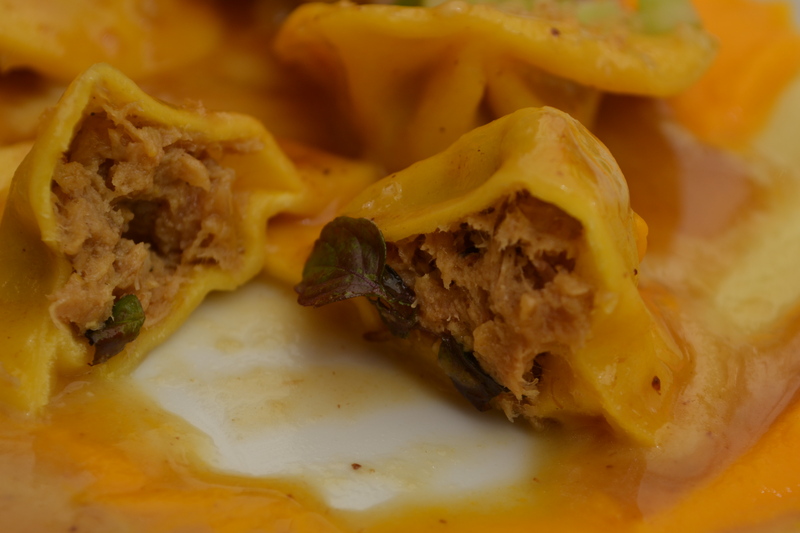 He said it was possibly the best he’d had, with La Porta’s in Monticchiello being a strong contender. Smug Geoff. We returned for lunch two days later. 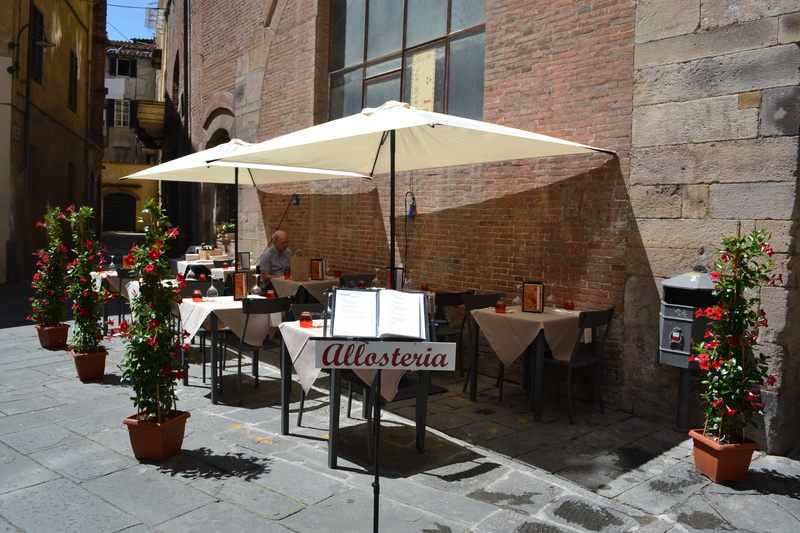 Just around the corner from Allosteria is their outside eating area which is in a quiet square with an old church in the back streets away from the maddening crowds and pigeons. We were the first to arrive and so luckily we chose to sit in the shade as it was a really hot day, the first which was typical seeing as it was our last day. We again received a warm and friendly welcome and the loo door opened for us once again. 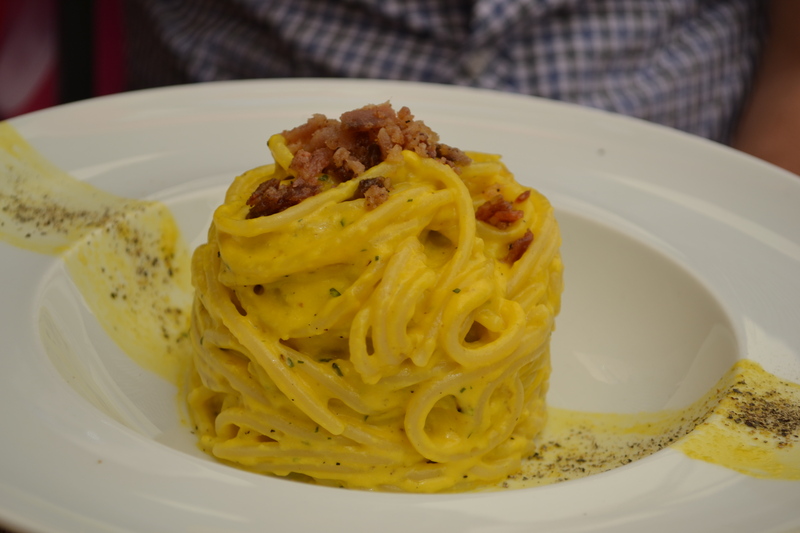 We were given a basket of bread as before and chose just a pasta dish each along with a dessert. 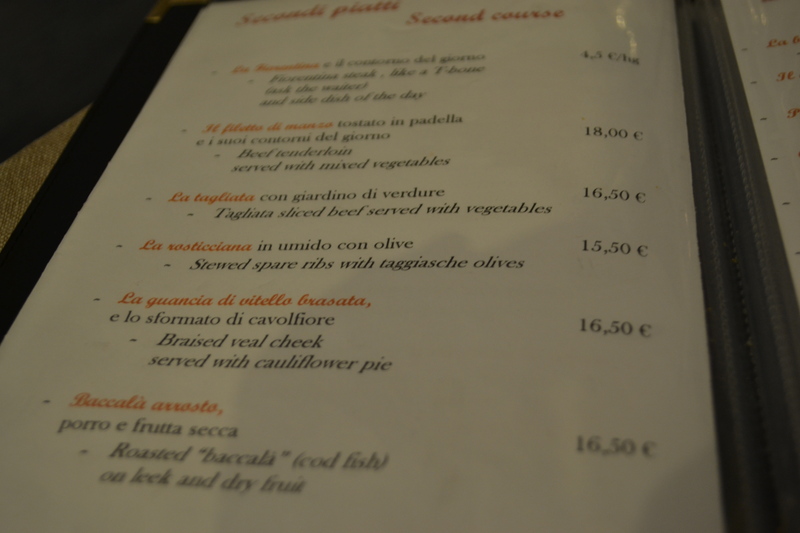 The waitress explained each dish when it arrived. O M G! It was really really good! 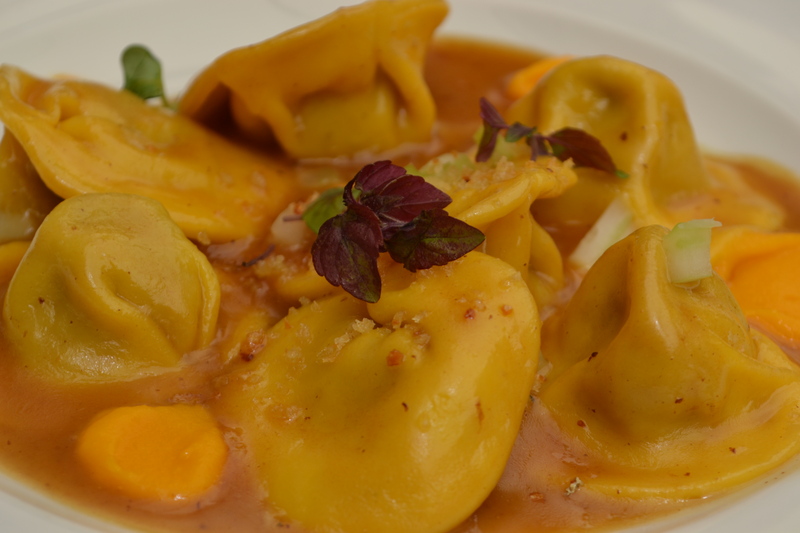 I had the i cappellacci ripieni, homemade ravioli filled with ossobucco, a cream of onions, carrots and celeriac. So many tastes. The carrot was puréed into little blobs on top of the creamy puréed celeriac and tiny bits of raw onion sprinkled on top. Also a little jus too. I had to mop up the gravy afterwards with the focaccia and fresh bread which Geoffrey thinks is rude but the waitress told me Italians do it and it is called ‘fare la scarpetta’ and was no problem. So there Geoff. Funnily enough I didn’t go for the degustation of chocolate this time, but the ‘tiramisu planet’. 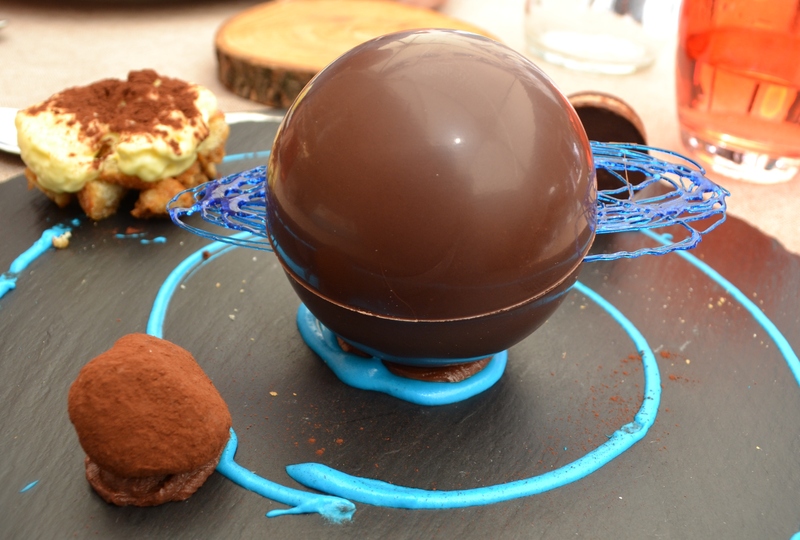 This was beautifully presented, on a black round slate with blue swirls of mascarpone made to look like the solar system and the planets were all chocolate. 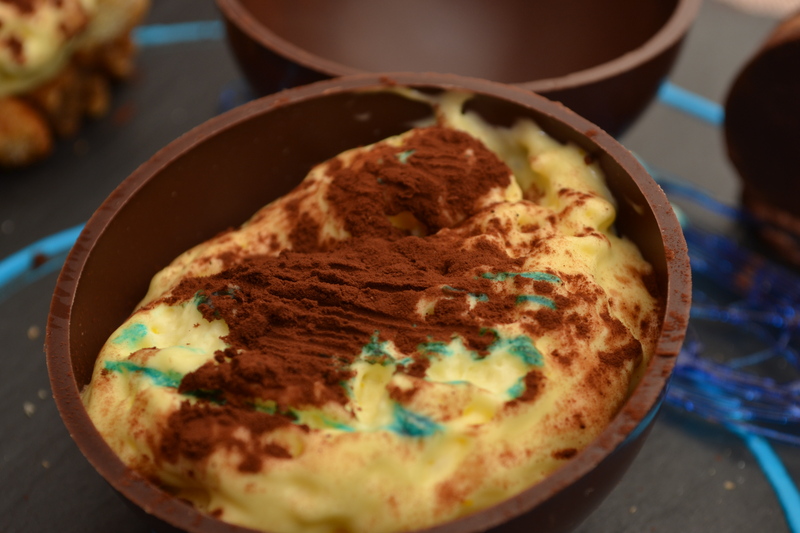 A portion of tiramisu, two dark chocolate discs which melted beautifully in the mouth with some sort of soft centre, a truffle, and the centrepiece was a large round chocolate ball with tiramisu inside, the dark chocolate shell again melting very nicely. Blue spun sugar was sandwiched between the chocolate to make it look like the rings around Saturn. The people on the table behind us saw the dessert and were impressed enough to to order it for themselves. I’d certainly made the right choice that day. We each had an espresso – the waitress wasn’t the first to ask us this week if we were sure that’s what we wanted as espresso’s are very strong – and we received a glass of limoncello each on the house, how nice. Most places we visited gave us a free limoncello with the coffee.